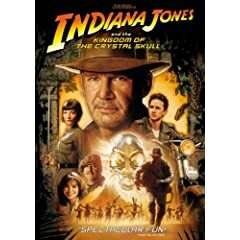 The fourth film in the Indiana Jones series, Indiana Jones and the Kingdom of the Crystal Skull, is out tomorrow, but if you need more of the man who made anthropology cool again, pick up Indiana Jones - The Complete Adventures Collection. Other theatrical releases this week include the well-received Romainian film, 4 Months, 3 Weeks and 2 Days; a 15th anniversary edition of Chaplin, War, Inc., and two releases by the Criterion Collection, Killing of a Chinese Bookie and Robert Altman's Short Cuts. Blu-ray discs continue to arrive for classic films, this week's assortment includes Poltergeist and Casino. Television releases include the eighth season of CSI: Crime Scene Investigation, the second season of Lil' Bush: Resident of United States, and The Sarah Silverman Program: Season Two, Vol. One. And for someone who actually owns an Ultraman wall clock, the release of the complete Ultraman series on DVD is cause for celebration. Among the documentaries out this week, Mathematically Alive: A Story of Fandom captures the behavior of Mets fans and is essential watching for any baseball fan. What are you buying or adding to your Netflix queue from this week's DVD releases?